UPJN Admit Card 2016: The UPJN stands the Uttar Pradesh Jal Nigam. It is developed in 1975 to improve the water supply & sewerage services and related to that. The Uttar Pradesh Jal Nigam has announced the Routine Grade Clerk and Stenographer Exam Admit Card notification on its official website. As like this, the corporation declared the notification for the recruitment of Routine Grade Clerk and Stenographer. The Uttar Pradesh Jal Nigam Corporation has 398 vacancies on these posts. So, they asked the interested candidates to apply for this Exam. Here, they announced the Admit Card availability those who all applied for the Exam. Scroll down and download the Admit card from the given Official Link. Each and Every year, the corporation of UPJN has notified the Vacancy status for various posts. Like that, the UPJN announced the notification along with the vacancy report as 398 for the post of Routine Grade Clerk & Stenographer. Most of the aspirants had applied for these post and waiting for their Admit card. 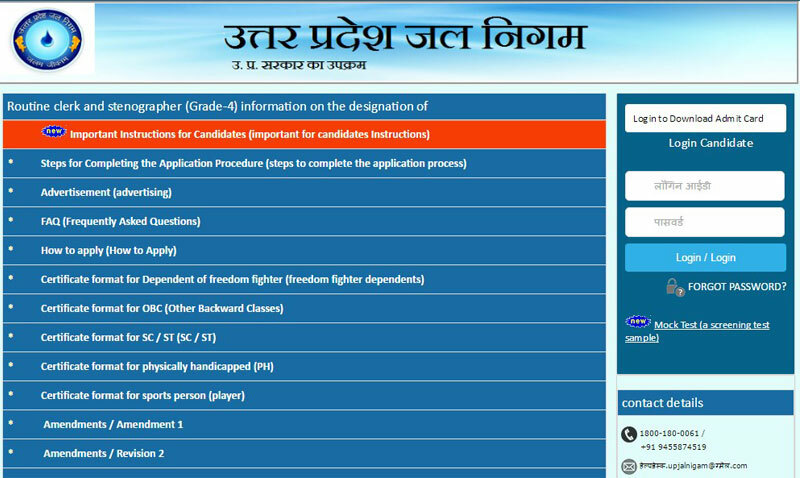 Here, the official website of UPJN released the Admit Card for the post of Routine Grade Clerk & Stenographer. The Exam date was scheduled on the dates from 5th to 7th August 2016. It is one-hour Objective type exam. Those who all cleared this exam can call for the further rounds. If you cleared all the remaining attempts, then you will place on respective post. Kindly Click the Above Direct Link or Visit the homepage of UPJN official website. Enter your User Id and Password on respective login field. Click Login Button now after entering the user ID and Password.